Three models are available to meet varying production needs. Machine die capacity is based upon a standard twelve cell egg carton. Two, four, or six dies. Maximum afterpressing depth capability of 2.75″ or 69.8 mm. Conveyor timing systems control product feed into afterpress machine. Constant speed gear motor drive system to match customer specifications. 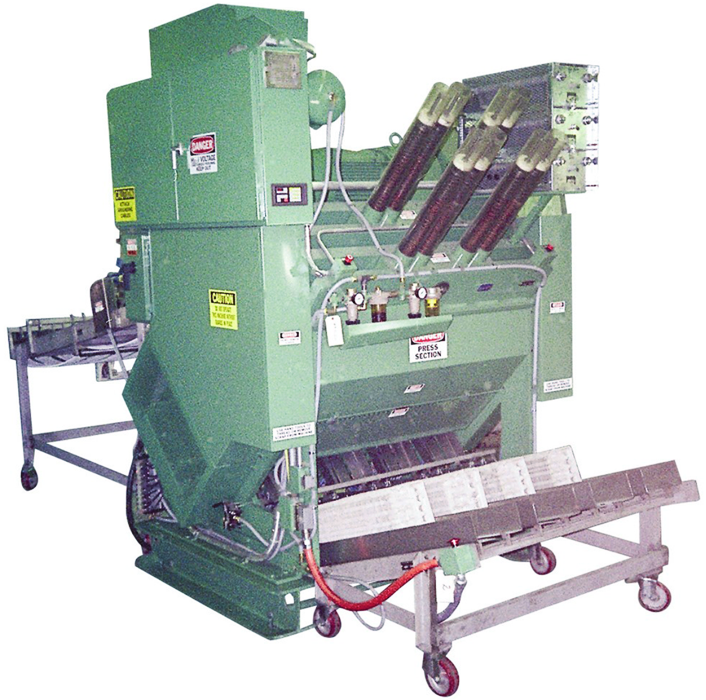 Individual die heat controllers monitor afterpress die temperatures. Machine timing is controlled via programmable logic control modules. Stackers are available for afterpessed products. Product spray station is available for afterpressed products. 3 Models available to meet varying production needs. Machine timing controlled via programmable timing unit. Infeed and delivery conveyors made of stainless steel. Conveyor timing systems control product feed into afterpress. Press construction of rugged steel weldments. Stacker units for afterpressed products. Complete guarding for maximum operator safety. Ancillary equipment for tooling installation and adjustment.